As many of you may or not be aware of, CorkSport recently re-released our downpipe for the 2010 Mazdaspeed3’s. This downpipe will also fit the prior generation of Speed3’s 2007-2009, however the devil is in the details. I have been relentlessly pursuing the elusive check engine lights that are associated with removal of the stock downpipe on the 2010 Speed3’s. These models are a bit more elusive and harder to pinpoint the sweet spot for the secondary oxygen sensor to eliminate a check engine light. This sweet spot is becoming harder and harder to find due to stricter emission controls. This past week I have been driving our company car from home to work and back. As much as my boss loves me racking up miles, to the tune of 67 a day, on a brand new car from Vancouver, WA to Oregon City, OR it’s all done in the name of science. 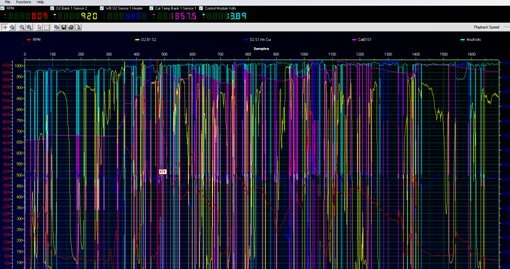 In an effort to understand the cars behavior and make slight corrections, documenting as much information as the data logging software will allow. Checking voltage to 02 sensors, Catalytic temperature and Engine RPM and Run time. 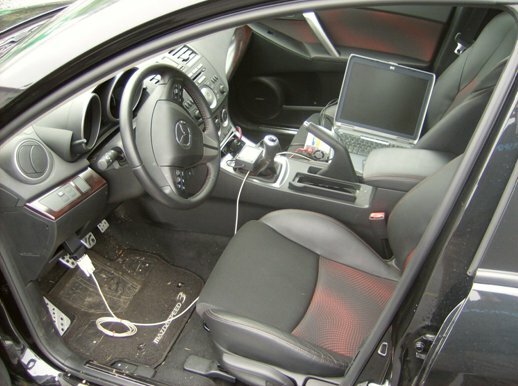 While driving down the local highway I am constantly monitoring the cars behavior, hooked up to the OBD-II port, viewing data on the laptop sitting in the passenger seat. Wires dangling over the steering wheel, chords draped across my legs power inverter plugged into the 12V outlet, in a way I feel like a mad scientist who is monitoring the vitals and trying to resurrect a sick patient. The code I am battling right now is P0421. This trouble code means that the oxygen sensor downstream of the catalytic converter is detecting that the converter is not working as efficiently as it should be (of course, it is not even there!). As I continue to work on this non-life threatening issue, rest assured that the CorkSport Mazda Medical Center is actively perusing an antidote to rectify these symptoms. Have you considered adding a bung for the O2 sensor downstream of the second cat? It wouldn’t allow you to run a completely open exhaust, but it might allow you to install the superior aftermarket downpipe while not getting a CEL. Next PostNext OMG A GIRL WORKING ON A CAR!